Satan, once one of God’s favorites, now His Adversary, grows impatient with the plan and begins to harvest souls. In a fell swoop, he throws reality out of whack and the world into chaos. God calls on Paul and his friends Amy and Joe to set things right. The young teens journey through a messed up world—with a little help from an angel—struggling against everything the Adv Satan, once one of God’s favorites, now His Adversary, grows impatient with the plan and begins to harvest souls. In a fell swoop, he throws reality out of whack and the world into chaos. God calls on Paul and his friends Amy and Joe to set things right. The young teens journey through a messed up world—with a little help from an angel—struggling against everything the Adversary can throw in their path to accomplish their Sudden Mission. With their world and their parents’ lives hanging in the balance—and the Adversary sending everything from zombies to Samurais to stand in their way—Paul will discover if he has the strength and faith to set things right again and stop Satan’s harvest. To ask other readers questions about Sudden Mission, please sign up. “Sudden Mission” follows Paul on his journey to save the world. It’s all good troll, zombie, and alien fun until a significant character dies. From that point on the severity of the mission resonates. My favorite parts of the book occurred in the “real” world. I was a little less interested in the role-playing chapters as the stakes didn’t feel as high. There is a high body count, and no magic reversals, but the deaths and the part the main characters played in them is handled with appropriate gr “Sudden Mission” follows Paul on his journey to save the world. It’s all good troll, zombie, and alien fun until a significant character dies. From that point on the severity of the mission resonates. My favorite parts of the book occurred in the “real” world. I was a little less interested in the role-playing chapters as the stakes didn’t feel as high. There is a high body count, and no magic reversals, but the deaths and the part the main characters played in them is handled with appropriate gravity. This is the first in a series. I bet most readers will be eager to pick up the next book in the series, but this book does wrap up nicely and one doesn't have to finish the series to enjoy it. Sudden Mission is an action packed YA Christian novel. Seriously. This is one of the most action packed Christian books for teens I have ever read. It kept me wondering just what was going to happen next. The adversary, Satan, has set up a series of awful tribulations for humans over the entire earth. There's no shortage of aliens, zombies, plagues, and scary fog! And to top it off, one teen, with the help of his friends, has been chosen to end this. The journey is the story, and it's more than Sudden Mission is an action packed YA Christian novel. Seriously. This is one of the most action packed Christian books for teens I have ever read. It kept me wondering just what was going to happen next. The journey is the story, and it's more than just a journey. Paul has to face loss, rejection, and the adversary, which is no easy task. Guy L. Pace brings to light how we, as Christians, have to face the adversary and not fall for his lies, but with God, anything is possible. Oh my gosh! this book was so awesome! When I saw the blurb of this book, I just KNEW I had to read this book. I'm so glad that I did! It's such a wonderful story that keeps you on the edge of your seat wanting more and by the grace of God, all things are possible. I loved the characters in this book and how different they are yet they go together perfectly. I loved how this book was written, everything just flowed and came together perfectly. I I received this book in return for an honest review. When I saw the blurb of this book, I just KNEW I had to read this book. I'm so glad that I did! It's such a wonderful story that keeps you on the edge of your seat wanting more and by the grace of God, all things are possible. I loved the characters in this book and how different they are yet they go together perfectly. I loved how this book was written, everything just flowed and came together perfectly. I loved all the obstacles they had to face as well. It was very original, I've never seen anything like this before. The mixes of everything was mind blowing. If you haven't read this book before I fully recommend it. I don't usually review young adult fiction, but I am willing to support new Christian authors and if I like the description, this genre is fine with me. I am glad I read Sudden Mission. This novel showcases Pace's creativity and for a debut novel, he has succeeded in crafting a fast-paced, action-filled novel that I can see why it appeals to the teen/young adult audience. Pace admits that he is geared towards writing for young adults and this novel shows that very well. I have not read many nove I don't usually review young adult fiction, but I am willing to support new Christian authors and if I like the description, this genre is fine with me. I am glad I read Sudden Mission. This novel showcases Pace's creativity and for a debut novel, he has succeeded in crafting a fast-paced, action-filled novel that I can see why it appeals to the teen/young adult audience. Pace admits that he is geared towards writing for young adults and this novel shows that very well. I have not read many novels in this genre but for those I have, I have enjoyed, and I did enjoy this one. Sudden Mission is a YA Christian Thriller by Guy L. Pace and is his first novel in the Spirit Missions series. I'll start by saying that I don't often read Christian YA, although I read plenty of Christian adult fiction, so i'm not the target audience for this novel. What the book tries to do, it does with moderate success, but overall I feel its weaknesses kept it at a mediocre read where it should have been a good one. 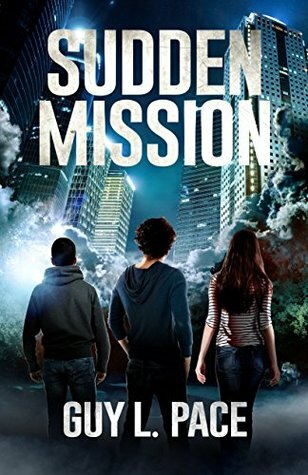 I'll start with a description of the story, then discuss the positives and Sudden Mission is a YA Christian Thriller by Guy L. Pace and is his first novel in the Spirit Missions series. I'll start by saying that I don't often read Christian YA, although I read plenty of Christian adult fiction, so i'm not the target audience for this novel. What the book tries to do, it does with moderate success, but overall I feel its weaknesses kept it at a mediocre read where it should have been a good one. I'll start with a description of the story, then discuss the positives and end with the negatives. Synopsis: Paul, a teenage track runner, encounters an enigmatic coyote staring him down in the morning of what is the beginning of apocalyptic events around the world. His parents are mysteriously sent to Charlotte, North Carolina where they are trapped by an invisible dome. God sends Paul (along with his two best friends Amy and Joe) to Choteau, Montana to end the madness. The trio encounter various enemies, including zombies, dark monks, and aliens, to defeat The Adversary. - The author clearly has an imagination that is teeming with ideas. His creativity shows in the various scenarios and enemies that the trio encounter. There seems to be no limit to the types of foes his heroes combat. However, this does end up becoming a double-edged sword for the narrative. - The character of Gabriel, the angel, is well done and was probably my favorite character. He was strange and otherworldly, as angels should be, and his portrayal was more unique than over variants i've seen in other novels. His speech pattern also felt "angelic" in a sense. - It is apparent the author has traveled alot in his life. There is in-depth knowledge of areas all around the continental United States and it really gives the reader a fun sort of "tourist feel" as the heroes hitchhike across America to reach Montana. - The dialogue for the adversary was well done and probably the most interesting part of the novel. I felt The Adversary's speech evoked an unease in the reader and captured that forsaken feeling that Satan should embody. - The novel does an effective job of delivering a strong and clear Christian message of dependence on God, on His sovereignty, on how Jesus is in control no matter the tragedy. The message is a bit too blunt and could have used more artistry in its delivery, but it was good and consistent. A message teenagers for sure need to hear. - Although the author has a broad imagination, and it STARTED OUT as a positive, it soon became the most staggering negative in the novel. The enemies became repetitive to the point of boredom. About 40% through the book I began to notice a pattern. Every chapter soon followed this formula: "Paul and crew hitchhike -> catch a ride with kind stranger -> encounter X creature (monk, samurai, alien, etc) -> defeat creature -> Paul and crew hitchhike". This pattern occurred so unabashedly and without deviance from this formula that it actually heavily damaged my experience. - The main protagonists (Paul, Amy, and Joe) are rather bland and see little growth in the story. This became more frustrating when the story was bloated with so many combat encounters that all occurred the same way. None of the battles grew the characters in any meaningful way and the only time we saw any change in characters was after a character death, but they seem to not be affected by it much anyway. The kids start with strong faith in God and end with that. Even their opening traits of being a track star, or a football player, had nothing to do with the characters after the first few pages. This made it hard to care about any of the characters and made the last half of the novel a bit tedious. - The world-building was definitely the weakest part of the novel. Everything was a bit too ridiculous and had no confines to fit into a comfortable narrative. Like, the story is set in modern day, but then cities just start disappearing, and then aliens, goblins, zombies, monks, more aliens (which evidently had nothing to do with satan, they were just...aliens invading? ), the list goes on. There is no consistency, there is no clear idea of how strong the Adversary is or how strong God is. And because of that there was no clear idea of stakes. After the 7th combat encounter, I just realized that Paul was basically invincible because he had faith. It removed a lot of the danger. - I'm not gonna lie, I really disliked the ending. It felt anticlimactic and underwhelming. I was displeased with the "answer" the author gave to rectify the atrocities happening. On top of that it ends with this strange half-cliffhanger. It was just an unsatisfying ending all around. - Sudden Mission is a book that is targeted to teenage Christians. I'd say it is best read specifically by that audience. The book is an ambitious story that is too constrained by its problems to reach its full potential. Being the author's debut novel is somewhat understandable, but i'm not sure if the characters pulled me in enough to see what happens next. This is an unusual YA book, which is fine. It's filled with plenty of action and excitement. Readers follow high schooler Paul and his friends Amy and Joe across the United States as they avoid all kinds of obstacles on a quest to "set things right," according to Angel Gabriel. Their challenges range from black fog and white fog to invisible domes that cover cities to zombies, four-foot aliens in flying saucers to samurais. That action keeps you going and might be enough for many YA readers. But This is an unusual YA book, which is fine. It's filled with plenty of action and excitement. Readers follow high schooler Paul and his friends Amy and Joe across the United States as they avoid all kinds of obstacles on a quest to "set things right," according to Angel Gabriel. Their challenges range from black fog and white fog to invisible domes that cover cities to zombies, four-foot aliens in flying saucers to samurais. That action keeps you going and might be enough for many YA readers. But the first hurdle is, of course, the major suspension of disbelief. Not only does the reader need to accept the fact that Satan would recruit zombies, aliens and samurais to fight for him, but that in all the world three high schoolers would be recruited to travel from North Carolina to Montana to right this wrong. It's the stuff of fantasy and more specifically, video games, and at one point, the story diverts into an RPG where Paul and Amy become characters. I would have had an easier time of this storyline if there had been a more reasonable explanation for why this all happened. But the answer is simply, Satan decided not to play by the rules anymore. Had there been a more plausible explanation, I might have had an easier time buying into the story. The second hurdle I had was that there were many external obstacles, but I didn't really see any internal ones. I would have loved to see some character development by Paul and his friends. This coming-of-age, chosen-to-save-the-world story typically includes some self doubt or growth on the part of the main character, but I didn't find that here, and that was disappointing. It would have made the story a lot richer. I give Sudden Mission by Guy L. Pace 4 out of 5 stars. When a black fog descends on Washington, D.C. and their families mysteriously disappear, Paul, Joe, and Amy’s world is turned upside down. It gets even crazier when an enigmatic man shows up and tells Paul he’s the one responsible for making it right. From start to finish, there is never a dull moment – trolls, zombies, demonic monks, aliens, and samurais. A carefully-planned cross-country trek from North Carolina to Montana takes several unex I give Sudden Mission by Guy L. Pace 4 out of 5 stars. From start to finish, there is never a dull moment – trolls, zombies, demonic monks, aliens, and samurais. A carefully-planned cross-country trek from North Carolina to Montana takes several unexpected turns including a warp with fantasy elements, and along with the characters, you wonder if they’ll ever make it to their destination, and what they’ll face when they get there. The protagonists – Paul, Amy, and Joe – are compelling, and they are joined by a diverse cast of characters throughout their journey. The coyote reminded me of D from The Field, probably because in essence, they are the same character. It was interesting to consider how the enemy uses the same tactics on everyone: deception, trying to get them to give up, attacking what is lacking in them,… I’m grateful to see more books exposing these tactics. I was somewhat disappointed in the climactic moment, which, after everything leading up to it seemed, well, anticlimactic. I think I just wanted something bigger. Overall, though, this is the kind of story I can see my nephews reading and loving, and I highly recommend it for teen and preteen boys. Full Disclosure: Guy L. Pace and I are both published through Vox Dei. This review was not solicited, and contains my unadulterated opinion. My friend and fellow veteran Guy Pace is an author and I recently picked up the Kindle version of his first book, Sudden Mission. I don't often read fiction and I had no idea what this book was about! I don't write many reviews either, but I thought this one was worth it. Sudden Mission is a story about a group of teenagers on a journey across the United States to complete a mission for God. I found myself reading the book in one hand while following along the journey on Google Maps in the other. My friend and fellow veteran Guy Pace is an author and I recently picked up the Kindle version of his first book, Sudden Mission. I don't often read fiction and I had no idea what this book was about! I don't write many reviews either, but I thought this one was worth it. Sudden Mission is a story about a group of teenagers on a journey across the United States to complete a mission for God. I found myself reading the book in one hand while following along the journey on Google Maps in the other. It's a Christian story set in modern times and designed for young adults. I genuinely enjoyed this book, probably more so because it is much different from the sometimes dense non-fiction that I often read. As a result, it was easy reading and I finished the book in a few hours. None of this detracts from the powerful message that Guy has interwoven into the story. The teenagers' friendship and relationship with God is pivotal to their mission. Most importantly, Sudden Mission is about their faith and how it guides their journey.